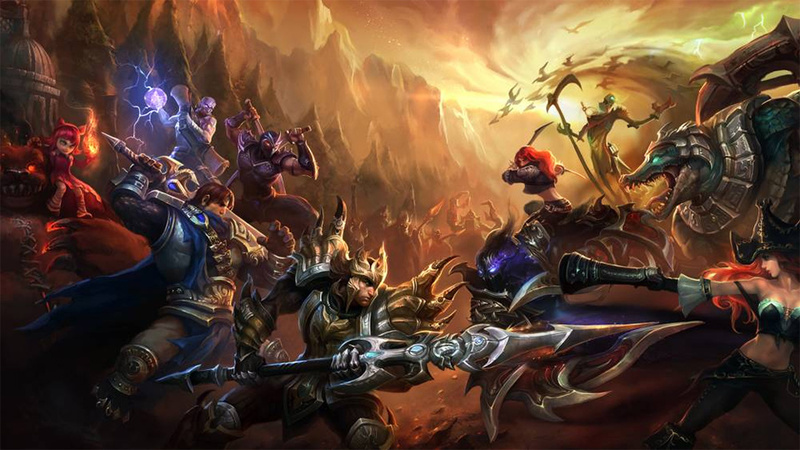 Continuing a recent crackdown on the kind of behaviour that gives the game a bad rap (at least amongst those who don't play it religiously), League of Legends developers Riot have permanently banned two prominent eSports players for their "toxic behaviour in-game". Ilyas Hartsema, aka enVision, whose "peak harassment score placed the account among the worst 0.06% of all European accounts this month", according to Riot, was banned having "established an undeniable record of in-game harassment, abuse, and poor behaviour." Amazingly, it's not the first time he's been punished by Riot; a previous account he held "registered one of the highest harassment scores ever recorded". Charming. Damien Lorthios, aka Linak, is the second player banned, for much the same reasons, and amazingly he's been censured for having displayed this poor behaviour outside of games as well as inside them. In closing, the game's tribunal says of both players that they displayed a "persistent tendency to engage in verbal abuse, insults and offensive behaviour is unacceptable for any player, especially a high-profile eSports competitor who has a regular opportunity to lead the community by example." Good to see that they're held accountable much like regular sportsmen would. Nah the baguettes got me. Imagine the limp bell-ends flopping over the side. I await the Oprah interview. I know very little about the mechanics/culture of this game - what is the cause/target of the abuse? It is screaming obscenities at opponents or berating teammates (or both)? Imagine if you took all the nerdiness of WoW, then put it into a simplistic RTS game, where you play competitively with other people (who can skrew up) against other people (who can totally roll your team). Now imagine all the yelling/abuse against teammates and the enemy. Problem with LoL compared to WoW is the incentive for you to play nice with other people is pretty much nonexistant. In WoW and most MMOs you play in a persistent environment/server and usually a guild - spouting off in guild or in your server window will earn you a bad name almost instantly and it will sometime make you almost unhirable because they know you dont work well with other people. In LoL however you work in a much more smaller and a more 'fluid' team dynamic. And from what i heard you can go off on your own as well. And to make things 'worse' - the game is purely all about pvp competition which gives off a slightly higher competitive edge compared to PVE based games. Its the perfect storm/brewing ground for these sorts of people, unfortunately. As a LoL player, this is pretty much spot on. Cool - thanks. I guess it is the usual internet anonymity factor as well - because any team sport generally leaves you open to being rolled if a teammate messes up (e.g. soccer) but (generally speaking) doesn't end up with the kind of "toxic" culture you hear about with LoL etc. Man these MOBAs are reliant on toxic behaviour. Maybe because LOL is a bit more mainstream, I hope HoN doesn't go all soft.